Holiday | Om nom nom! Well, we’ve gone and done it and bought the farm of our dreams! The horses are right out back now, so it’s a lot easier to cook. Back to recipes. It seems fitting that the first one I’m adding to the site is a cake we served at our housewarming party. This is a 10+ year old Cooking Light recipe that always goes over well. It is great for Thanksgiving, or any other fall occasion. It also makes a great coffee cake! Cute, easy, and disappeared fast! These were a fun Halloween dessert, but could also be great for Thanksgiving if you don’t want to make a whole pie. I would say don’t skip the butterscotch topping – really made it! Also really portable – great for pot lucks! I really liked these. Any time these appear on a cookie tray, I have to restrain myself from eating all of them. So I decided to go ahead and make them myself this year – definitely will be a regular addition in the cookie tins. This is from Joy of Baking. This may be one of my favorite cookies I’ve ever done – but I love all things mint. Definitely a popular one in this year’s cookie tins. Another new cookie in this year’s holiday cookie extravaganza, this one was cute and went over well. A twist on peanut butter blossoms. One of the cookies for our yearly holiday cookie tins – as much as I am not a fan of chocolate, I really liked this one. Simple and makes a lot, too. 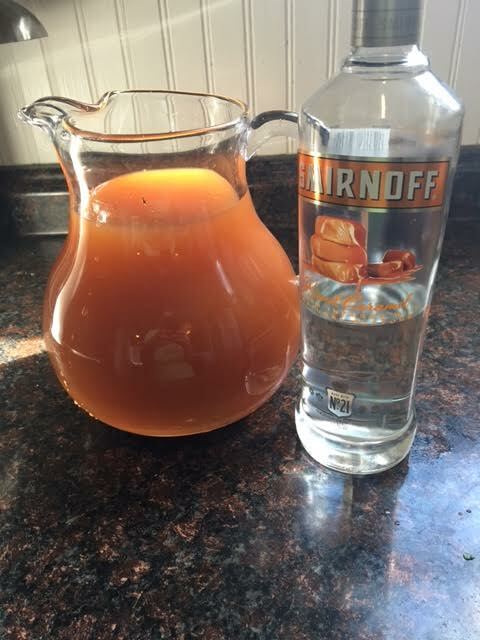 This was a seriously delicious (aka dangerous) cocktail we served at our Halloween party. It goes fast, so make plenty! Great for any fall get-together.